Has your love ever been offensive? I ask because I’m trying to hold the various passages assigned for this morning together in some way. In Jeremiah we hear God reassuring the young prophet that God will be with the child as he delivers the Lord’s judgment against the nations. Luke’s gospel plays out like Jeremiah’s greatest hopes and fears as those who hear Jesus in the synagogue are first drawn to him in admiration, then so enraged by his interpretation of scripture that they are ready to throw him off a cliff. But in-between these two stories comes the excerpt from Paul’s letter to a community in conflict, exhorting them to speak to one another in love. Everything is subordinated to love: the prophetic word, acts of charity, even martyrdom. No expression of faith is complete unless it is performed in love. So then, what do we make of Jesus’ acts of provocation when he returns to the synagogue in his hometown? Where is the love in his agitation of the village that raised this child? As a reminder, Paul’s letter to the Corinthians isn’t trying to account for Jesus’ behavior in Nazareth. It’s written to a different group of people experiencing a very different situation. And, as I explained a few weeks ago, even the lectionary which assigns readings for each Sunday isn’t trying to force a connection here. During these Sundays in the Time after Epiphany the second reading has been working its way through First Corinthians. The lectionary isn’t assuming any particular thematic resonance between the gospel story and Paul’s letter to the church in Corinth. So what I’m engaged in here is a minor act of constructive or systematic theology, trying to create a coherent biblical worldview out of disparate scriptural materials. It’s just curious to me that right next to two stories about young prophets sent to deliver challenging messages to audiences set in their ways we also hear Paul’s reminder to root all our speech and all our actions in love. That’s what leads me to ask: has your love ever been offensive? There are some obvious answers to this question. For all the years that I’ve been alive on this earth there’s been a conversation going on in the public square about which kinds of love are acceptable and which are not. Before we were preoccupied with love between people of the same gender we were just as preoccupied with love between people of different ethnicities. God forbid people of the same gender, and different ethnicities. To advocate for our own right to exist, to search after love, to find it and claim it, was deeply offensive to the majority of our neighbors. Until it wasn’t. But not all love is romantic, surely. Are there other forms of love that give rise to offense? But can that work — the work of reforming a world that is stacked against the poor, the weak, the undocumented, the elderly — be done in love? If so, how does that change our notions of love, how it looks and sounds? That insight, that anger is a vivid form of caring that signals to us a tear in the fabric of our relationships with one another helps me interpret what I read as anger when I listen to Jesus’ exchange with the people of his hometown. After impressing them with his reading of the prophet Isaiah, he pushes through traditional interpretations of scripture to make an uncomfortable point: There were plenty of widows starving in Israel during the time of Elijah, but God sent the prophet to a foreigner instead. And there were plenty of lepers in Israel during the time of Elisha, but God sent the prophet to heal a foreigner instead. As we wrap up our three week series of testimonies organized around the theme, “Immigrants and Refugees, Strangers and Aliens” we have been challenged to remember that the God of Epiphany, who is a light to nations, does not claim any one nation as God’s own. Instead, God is always reaching out to all of us through the stories of people who share our common humanity, but whose lives are so very different from our own. That truth seems fairly innocuous until it rubs up against the way power and wealth have been arranged in the world. Until we insist that it should affect how we talk about poverty and taxation, how we should talk about housing and urban planning, how we should talk about immigration and border security, how we should talk about war and foreign debt relief, how we should talk about our enemies and national security. It’s not that Jesus has no love for the people of Nazareth, his hometown. It’s just that he’s been called and sent by the God of Jeremiah and Isaiah, the God who chooses all people as God’s people. And when that God looks at how we have divided ourselves from one another, God is angry. You hear it in Jesus’ tone. It is patient, but it is not passive. It is kind, but it is not accommodating. It is not arrogant, but it is insistent. In Jesus we see and hear the power of anger in the work of a love that in the end does in fact bear and endure all things so that we might believe all things and hope for that which we thought was impossible. On some level, I guess, all love is offensive — because love treats others as if they were of equal significance as us ourselves. Love transforms others from objects into subjects. In a world that is constantly tempting us to consider our own needs first, that celebrates greed and consumption, love is the only force that can disarm our hyper-vigilance and call us down from the guard posts on the walls that divide our nations, our cities, our hearts. The bible is filled with these stories, stories of love and anger, stories of commissioning and sending, stories of children who are prophets and preachers who are peace-makers, stories of God’s offensive love. Stories that make a claim on us, and require us to sit with them, read them, inhabit them, occupy them, until we can claim them as our own. If American democracy fails, the ultimate cause will not be a foreign invasion or the power of big money or the greed and dishonesty of some elected officials or a military coup or the internal communist/socialist/fascist takeover that keeps some Americans awake at night. It will happen because we — you and I — became so fearful of each other, of our differences and of the future, that we unraveled the civic community on which democracy depends, losing our power to resist all that threatens it and call it back to its highest form. Or, put more simply, if community built on the ideal of power emanating from the people for the sake of the common good fails, it will not be because of how others used their power, but because of how we gave our power up. How do you give your power up? Under what circumstances do you find it easier to point the finger and blame others for the plight of the present, rather than to acknowledge your own participation in creating the situation you lament? Is it in your workplace, in your relationships with your colleagues? Is it at home, with your spouse or children? Is it here at church, as we face some of the most challenging conversations of our life together? Where is it that you notice yourself telling a story in which everyone else has all the power, and you are a victim of their actions? We come by it honestly, our inclination to give up our power. We live in a world that creates wealth by assigning blame. Our litigious society rewards people for seeking out lawsuits that might enrich them at the expense of others by assigning blame for every harm. The constant ideological battle that passes for the news paralyses the nation by blaming elected officials and political parties for every ailment suffered by society, creating a culture of fear and mistrust. Rarely are we invited to consider how we ourselves have participated in creating a climate of mistrust, blame, and powerlessness through our own tendency to gossip, criticize and slander rather than truly listen, discern, and collaborate in building the world we need. Instead we settle for tearing down the world we have and wondering how others allowed things to get so bad. Power is at the heart of the readings that surround us this Sunday, readings filled with images of shepherds and sheep, readings filled with conflict between people assumed to have power and people challenging the arrangement of power. Of course, the name by which Peter and John have acted, their authorizing agent, is Jesus of Nazareth, a human being located in space and time, living under empire and challenging the collusion of church and state; and also God’s own beloved, the anointed one, the messiah, the Christ — the two natures being inseparable: a human being acting in space and time and the beloved child of God revealing God’s own self to all the world. Jesus is navigating a very similar situation in the gospel of John. We get only a snippet this morning of the much longer speech in which he names himself the good shepherd. It is an image that pervades the Christian imagination, Jesus carrying the lamb over his shoulders, a shepherd’s staff in hand. Again, if we read back, behind the passage assigned for this day, we discover that the incident which has precipitated Jesus’ speech about sheep and shepherds was another healing miracle. In this case, a man born blind. When Jesus heals him of his blindness it creates a scandal as those in power demand to know by what power the man has been healed. As the authorities get tangled up in questions of power, the man who has been healed finds his voice and praises God. Jesus explains the miracle using this metaphor of the shepherd whose job it is to find those who have been lost under the present arrangement of power, and to bring them back inside the fold, to be the gate, to be the guard, to do the work and to pay the price, which he does willingly, of his own accord, because of the great love that exists between the God who creates the world and God’s own beloved who redeems the world. Truth and action, both of which require us to acknowledge our power and to use it in service of those caught up in the world’s lie that the goodness of God’s creation was only meant for some of us, that a safe home, and an abundant table, and a loving family, and a fruitful marriage, and a rewarding vocation, and a peaceful city, and a just nation, and a redeemed creation are entitlements of the few rather than an inheritance for the whole. Easter life requires us to understand that the risen Christ rises in each of us. That the Holy Spirit breathed onto the church empowered the Acts of the Apostles. That the only hands and feet God has in the world are ours. This is not a form of “subtle works righteousness,” as Lutherans have sometimes worried. Works righteousness is the idea that we earn our standing before God, we earn our place in the reign of God, through our own actions, by our own merit. This is the exact opposite. This is the acknowledgement that we stand under the grace of God, as citizens in God’s commonwealth, because of God’s goodness and mercy and love. That all that we have and all that we are comes to us as a gift, and that to allow others to suffer second-class citizenship in a world intended for equality is to collude with a world order already governed by a hypocritical myth of meritocracy in which we pretend that everyone has gotten what they deserve while we all suffer the tragic consequences of structures of oppression, but some pay with their lives. 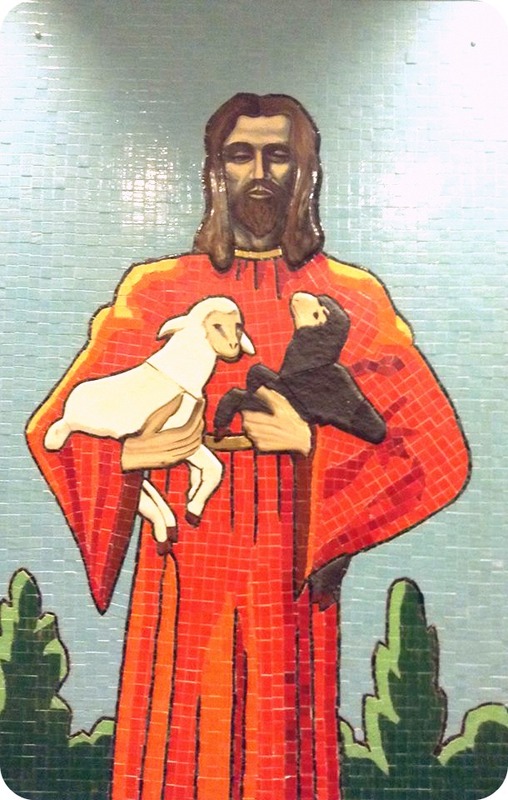 Good Shepherd Sunday is not some sweet, sentimental song to make us feel safe and secure. It is the assurance that God sets a table for us, even in the presence of our enemies, and that we live this life in the valley of the shadow of death, but that we do not walk through the valley alone. It is a reminder that the power of God is not the power of this world, which seizes and hoards, but the power of love, which willingly sacrifices. To acknowledge our power, and to use it, to spend it, to give it up for the sake of those other sheep, those other human lives, those other creaturely habitats, the whole creation called into being by the God who breathed over the waters and made something out of nothing, is what it means to act in the name of Jesus. It is the movement that gives his name any power at all. It is the life of God coexisting with the fragile humanity we all share. How will you use the power of the name given to you in baptism? How will your life, how will our life together, be a testimony to that power? Paul writes “knowledge puffs up, but love builds up” (1 Cor. 8:1) and Jesus enters the synagogue where he teaches “as one having authority, and not as the scribes.” (Mark 1:22) Read side-by-side, these two passages give me a bit of pause as a preacher, a member of a guild that strives to teach for transformation but all too often ends up confusing knowledge with authority. At first this is frustrating to read. Jesus teaches with authority, but Mark doesn’t bother to tell us what Jesus said, what passage of scripture he chose to read, what application he made between their shared Jewish heritage and the present moment. Whatever knowledge Jesus imparted, it was apparently not the most significant aspect of his ministry in the synagogue that morning. Instead of telling us what Jesus said, Mark narrates an encounter between Jesus and a member of the community described as having “an unclean spirit” (v.23). “What have you to do with us?” It’s a slippery question. Who is the man referring to? Later in Mark’s gospel Jesus will speak to a Geresene man possessed by a demon who identifies itself as “legion, for we are many,” (5:9) but this is not that encounter. Perhaps this event foreshadows that later one, and we hear the unclean spirit referring to itself as “us.” As I imagine the scene however, I place the man in the middle of the assembly gesturing to the people all around him as he heckles Jesus, “what have you to do with us?” It’s the sort of manipulation that playground bullies learn early on, to speak as though they represent a great many others. It’s the voice of “everyone knows” or “people are saying.” It’s the voice that inflates itself by claiming to stand for the majority. Ah ha! Now the real fear is exposed. First the unclean spirit questions what Jesus has to do with this community, this assembly; then it tries to incite a panic, “have you come to destroy us?” I suppose you could answer that question either way. On the one hand, the unclean spirit is right, Jesus has come to destroy the present arrangement of things. People and their families, synagogues and cities, powers and principalities will be upended and the world will not be left the same as it was. On the other hand, Jesus has not come to destroy but to heal, to liberate, to restore. Jesus is not the force of destruction, but God’s answer to the destruction of this world. The unclean spirit accurately names Jesus as the Holy One of God, before whom the status quo cannot stand, which is rightly threatening to most people, including us. When Jesus arrives, things change. Jesus came to the seashore, and soon the disciples were leaving their nets and learning to fish for people. Jesus comes to the synagogue and the spirit that has taken up residence there has to go. Jesus liberates people from habits of life and patterns of accommodation that hold the status quo in place. I think this is what the people in the synagogue mean when they ask, “What is this? A new teaching — with authority!” They recognize that Jesus is more than an interesting lecture, a warm sentiment, or a well-constructed sermon but that in him the word is embodied, that intention is joined to action in a way that will not allow the present arrangement of power to remain unchallenged. You can imagine how energizing this liberation movement could be to people and communities held under the thumb of empire. In fact, we know that within a few decades the apostle Paul was writing to the congregation in Corinth, for whom the knowledge of their freedom in Christ had taken on a rough edge, whose embrace of their liberated status had run rough shod over others in their community who were still coming to grips with the implications of the unfolding revolution. At that time animals were still being sacrificed to a variety of gods worshipped throughout the empire. Choice cuts of meat might be burned on an altar, then served in a meal, while the remainder of the animal was sold to the meat market and then re-sold to whoever might purchase it. If you were being especially conscientious in your religious practice and trying to avoid eating meat dedicated to other gods, it could be very difficult. In response some Christians avoided eating meat altogether. Others, however, ate meat freely arguing that since there is no god but God, that meat dedicated to those idols was truly dedicated to nothing, and that there was nothing to fear from eating it. Apparently their disregard for the concerns of those who were being diligent in avoiding such meat was creating conflict in the congregation, so Paul steps in to reframe the debate. The issue, he contends, isn’t whether or not it’s right or wrong to eat the meat. The issue is how you treat your neighbor who is earnestly struggling to live out their faith with integrity. The knowledge that there is no god but God may free you in principle, but if in your freedom you injure your brother or sister who shares your faith but not your knowledge, then what good has it done you or them? It’s not that knowledge is bad, it’s that it is secondary to love. When knowledge serves love, then the community is built up. When knowledge serves itself, then divisions creep in and take hold. The injunction to keep love at the center of our life together as Christian people can be terribly inefficient. It is often much quicker to dispense with love and rely on knowledge alone. The knowledge of who is right and who is wrong, who stands with us and who stands against us, who is our ally and who is our enemy, is the world’s standard operating procedure for getting things done. Cut the issue and count the votes. Secure the win. We see it in our national politics, in our corporate boardrooms, in our community organizing, and sometimes in our congregations as well. It is outcomes at the expense of process, creating winners and losers constantly vying to gain or regain their power. Knowledge without love seeks status. Knowledge with love seeks service. Perhaps this helps to explain why Jesus commands the unclean spirit to be quiet, not to reveal his identity, as he will command the leper he heals later in this chapter, or the disciples after he asks them who they believe him to be. Jesus is not seeking status, he is not concerned with whether or not people show him the appropriate level of respect. He has come to serve the creation by giving himself away in acts of love for the sake of healing, liberation and restoration. At the river Jordan a spirit descended on Jesus like a dove, demonstrating a solidarity between Jesus and God, a solidarity we are invited to enter into as well. There are other spirits in this world however, spirits that puff up rather than build up, spirits that divide and conquer. In our baptisms we are asked to renounce those spirits and give ourselves to the Holy One of God who has come to set us free from anything that would separate us from one another and the God who created us in love. What might it mean for us to renounce that unclean spirit, to exorcise it from our relationships to one another here in this congregation, from our dealings with those we disagree with at work or at home, from our politics — both local and national? What would it look like to use the freedom we have been granted by the gospel to meet those around us where they’re at, rather than to judge them for where they as yet are not? What are the conditions that make transformation possible? In my life knowledge has never been enough. It has always been love that has made me brave enough to believe that something new was possible. In the name of Jesus. God’s love made visible.